Jan. 28, 2019, 10:48 a.m.
Once print advertising collapsed, newspapers hiked prices to get more money from readers. If they hadn’t, they’d employ even fewer journalists and be in even worse shape today. By Joshua Benton @jbenton Jan. 28, 2019, 10:48 a.m. If you’ve been a daily print newspaper subscriber for any length of time — whether it’s a seven-day morning habit you’ve had for decades or a Sunday-only New York Times subscription you have mainly so your four-year-old will sometimes see Dada reading something other than a screen :raised_hand: — you’ve noticed prices have gone nowhere but up. A seven-day print subscription to the Times will now run you over $1,000 a year in much of the country. A subscription to The Boston Globe here in Cambridge will run you about $750 a year. The Washington Post or The Dallas Morning News will each run you about $650. And if you’re in that dying breed of single-copy buyers at a newsstand or coffee shop, those four papers would cost you, on a weekday, $3, $2.50, $2, and $2.49, respectively. Those prices have gone up fast. As recently as 2013, a weekday Boston Globe ran you $1.25 and a Washington Post or Dallas Morning News cost $1. And kids, gather ’round while I tell you about how angry people were in 2001 when a copy of the Post went from 25 cents to 35 cents. A year’s home delivery subscription to the Post cost about $130 back then. Even accounting for inflation since then, a Post subscription now costs about 3.5 times what it used to. The analysis documented industry-wide, more-than-substantial price hikes. Seven-day home delivery price more than doubled, and weekday single-copy price tripled. Seven-day subscription now costs $510 a year — print subscribers are paying on average $293 more to have the same newspaper delivered to their doorstep. Despite the increase in price, about two-thirds of print readers remained loyal to a product that has become much more expensive and is considered dying by many. The biggest price-hiker by a fair margin was the Los Angeles Times, who went from a quite-low $104 to about-what-you’d-expect-these-days $624 for a year of home delivery. But in general, these large newspapers increased their prices between 2× and 2.5×. Weekday single-copy prices went up even more, roughly tripling. That said…Chyi and I don’t agree on much when it comes to newspaper industry strategy, and I can’t say I agree with where she takes this interesting dataset from there. Chyi has argued in many papers that the perception that print is in serious decline is both false and self-inflicted — that is, if media types would just stop saying print is dying, it wouldn’t be. While the legacy format is important, “the death of print” is one of the most prominent themes in U.S. newspapers’ self-evaluation. This theme — or death narrative — has gone viral since the 2008 recession. In 2009, Time magazine published the list of “Ten Most Endangered Newspapers in America.” In 2010, Arthur Sulzberger, Jr., Publisher of The New York Times, said: “We will stop printing The New York Times sometime in the future, date TBD.” The Center for the Digital Future at the University of Southern California predicted that almost all U.S. print newspapers would disappear in five years — i.e., by 2016. This death narrative fostered a sense of crisis and cast serious doubts on the sustainability of print newspapers. A 2012 survey reported that as many as one-third of U.S. newspaper publishers envisioned a time when they would stop publishing the print edition. The pessimistic view about print has also influenced the industry’s digital transformation strategy, contributed to the “anti-print, pro-digital” discourse, and most importantly resulted in the continued disinvestments in the print operation. Since the recession, U.S. newspaper newsroom employment dropped by 45%. Tens of thousands of journalists, mostly those on the print side, lost their jobs. This resulted in a lesser product and the “suicide spiral” — newspapers may actually kill their core product through cutbacks. Therefore, “print is dying” is more than a narrative. Like a self-fulfilling prophecy, it has real, profound consequences in shaping the fate of newspapers and the future of journalism. As Chyi and Tenenboim note, these price hikes weren’t accidents — they were part of a conscious strategy on the part of newspapers. Newspapers had always been priced more cheaply than they cost to produce, because advertisers were the ones really paying the bills. (A typical American newspaper pre-web made about 80 percent of its revenue from advertisers, 20 percent from readers.) Advertisers wanted to get their messages in front of lots of people, so newspapers priced themselves low to maintain a mass audience. [Their research] basically says that if we raise the price by 40%, we would lose about 12% of the volume of the newspaper. So as things unfolded in latter 2008 and the economy went bust, we were glad to have this information. On May 1, 2009, we raised the home delivery price of The Dallas Morning News by 40% to our home delivery subscribers, and we raised it 100% to the people who were in the state [outside the Dallas area]. If you went back to November 1, 2008, we actually had doubled the price of the newspaper in a period of about a year-and-a-half. We lost, as this thing predicted, 12% of our subscribers. Most newspapers in the country have pricing power if they’ll only go out and take it. The Columbus Dispatch raised the price to their best customers, the ones they believed could afford to pay for it, by 100% and lost about 8% of their volume overall. I think they did a better job than we did. But this is an opportunity for how do we pay for journalism. I’ve got to find more sustainable revenue sources. And the consumer, who loves the newspaper, who isn’t going to give it up until they are six feet under, they will pay more for the newspaper, because we’ve subsidized the price over time. This study examined the extent to which major U.S. newspapers’ print subscription price and single-copy price changed since the 2008 recession. The analysis documented industry-wide, more-than-substantial price hikes. Seven-day home delivery price more than doubled, and weekday single-copy price tripled. In-market print reach declined across the board, but about two-thirds of print readers remained loyal to a product that has become so much more expensive. This study also updated research on U.S. newspapers’ price elasticity of demand. In most cases, demand for the print product has remained inelastic, which explains why so many newspapers implemented price hikes after the recession. And yet Chyi and Tenenboim portray this move as shortsighted. I suppose that if you think that the long-term future of American newspapers is as a mass-market print medium, I guess that makes sense. That’s just not the real world. Through empirically examining changes in newspaper price, this study uncovered another important aspect of consumer behavior: nearly two-thirds of newspaper readers have stayed loyal to the “dead-tree” edition despite price hikes as dramatic as documented in this study. This provides further evidence for newspaper readers’ stronger-than-expected attachment to the print edition. Demand for the supposedly “dying” product has remained inelastic, which explains why the print edition to this day remains the cash cow, the primary revenue driver, for newspapers across the board. Twenty years into newspapers’ digital experiment, it is crucial that publishers reassess reader preference and refocus on preferred platforms. Since readership is the foundation for advertising, readership declines at least partially contributed to the free fall in print advertising revenue from $42.2 billion in 2007 to $16.4 billion in 2014. Was turning away from the advertising model a wise strategy in the long term? Or, was the newspaper industry over-reacting to market fluctuations when the recession hit? Ten years after the recession, these questions are important and should not remain unanswered. But both history and their own data don’t match up with that. Newspapers raised prices after ad revenues collapsed — they didn’t “turn away” from ad revenue, ad revenue turned away from them. The huge ad declines happened in 2006-2010; the price hikes came after that trajectory was crystal clear. (Chyi and Tenenboim’s data collection is only for the years 2008, 2012, and 2016, not the years in between, but it’s clear that the really big hikes came after 2012. 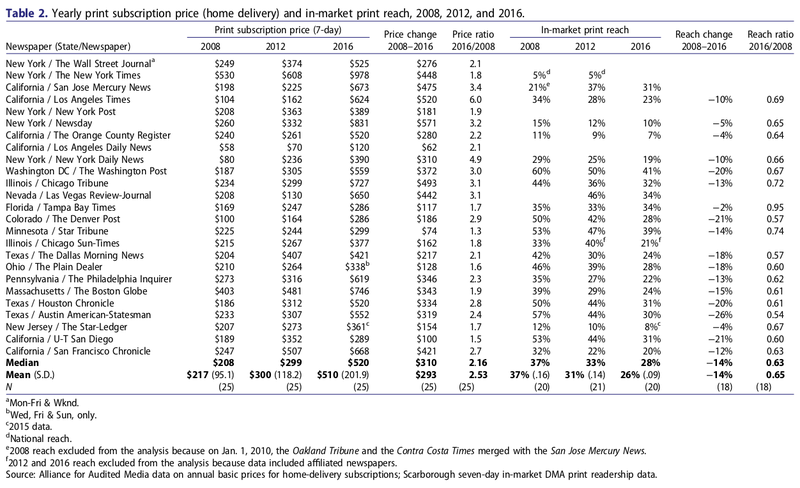 The median home delivery price in their study is $208 in 2008, $299 in 2012, and $520 in 2016.) The decline in print advertising was not some recession-only “market fluctuation” that only took hold because some papers raised prices. C’mon. I appreciate that we now have good data showing the extent of price hikes. If you think that, but for a few strategic missteps, print would be the business you want to be in in 2019 — then well, I guess you can criticize them as shortsighted. But if you’re someone who cares about the future of newspapers, generating more money from their most loyal customers is a good thing. It’s literally just about the only strategic move that’s worked industry-wide over the past decade. It’s not a play you can run forever — but it’s worked better than anything else in the playbook. Photo by Joanne Bourne used under a Creative Commons license. POSTED Jan. 28, 2019, 10:48 a.m.
Benton, Joshua. "Newspapers cost more than twice as much today as they did a decade ago (and that was a smart move by publishers)." Nieman Journalism Lab. Nieman Foundation for Journalism at Harvard, 28 Jan. 2019. Web. 20 Apr. 2019. Benton, Joshua. "Newspapers cost more than twice as much today as they did a decade ago (and that was a smart move by publishers)." Nieman Journalism Lab. Last modified January 28, 2019. Accessed April 20, 2019. https://www.niemanlab.org/2019/01/newspapers-cost-more-than-twice-as-much-today-as-they-did-a-decade-ago-and-that-was-a-smart-move-by-publishers/.